Allows auto dealerships, motorsports facilities, classic car storage facilities, private garages, showrooms, and convention facilities to safely and conveniently transfer vehicles between floor levels. 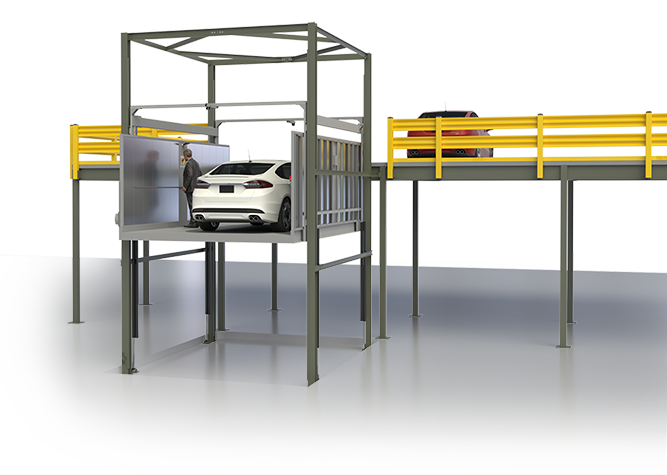 The affordable DriverLift™ is a rideable vehicle lift from Wildeck that has been designed for safe and efficient transfer of vehicles between levels. No more climbing stairs to catch up with your car on a material-only lift. The DriverLift allows authorized personnel to travel with their vehicle on the carriage, instead of relying on someone else to off-load the car. 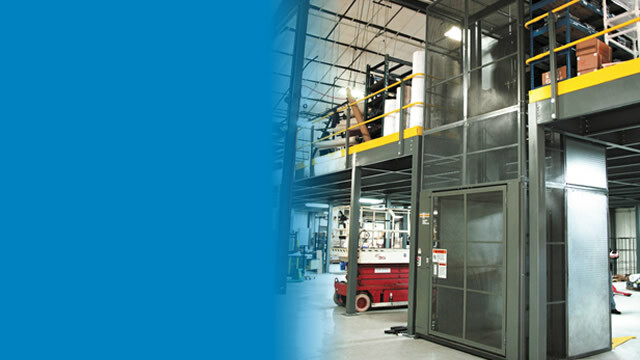 Wildeck's hydraulically operated lift offers the convenience of a passenger elevator, but with lower costs to install, operate, and maintain. The DriverLift complies with the ASME A17.1 / CSA B44 "Safety Code for Elevators and Escalators" and is a Type B Material Lift, rated Class B for vehicle loads. Wildeck's hydraulically-operated DriverLift™ is an ideal solution for the safe movement of vehicles between levels in your facility. It is more affordable, and easier to install than a passenger elevator, while offering many similar benefits. The DriverLift™ safely transfers authorized personnel and their vehicle to travel heights up to 14 ft., with a maximum capacity of 8,000 lbs. (class B rated for vehicle loads). A keyed "enabled" switch inside the carriage allows authorized lift use only. Up/Down push buttons inside the carriage control lift movement (requires contact pressure, per code). During use, call/send stations located outside the lift are disabled, and carriage access gates are securely locked. Choose between "C" or "Z" loading configurations, to meet your vehicle transfer requirements. Designed and manufactured in the USA to meet or exceed ASME - A17.1 / CSA B44 "Safety Code for Elevators and Escalators"
Carriage construction: Structural steel frame with diamond plate panels removable for maintenance. Standard paint color: Wildeck Gray. Purchased components are painted per vendor standards. Pit mounted E-Stop: When required. Maintenance control: Hoisting mast-mounted maintenance stand (shoring device) with E-Stop. Security: Keyed "enabled" switch inside the carriage to ensure use only by authorized personnel. Disables hall/landing stations when in use. Main power: 208/230/460 VAC, 60 Hz., 3-Phase (single-phase option available). Consult factory for other requirements. Hydraulic control: Remote mounted NEMA 12 control panel and hydraulic power unit are pre-wired prior to shipment (security cage provided). 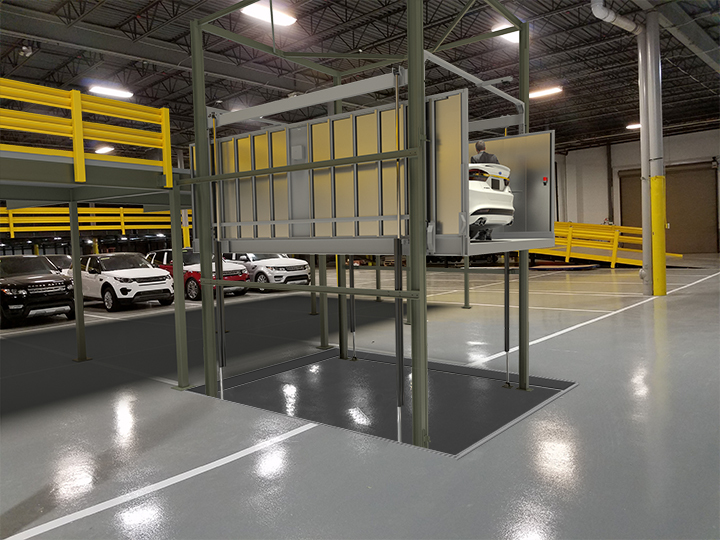 Application-specific DriverLift™ rideable vehicle lift drawings are provided for approval after receipt of Purchase Order and prior to equipment manufacturing. Owner's Manual includes installation, operation, and maintenance instructions for use by an authorized Elevator Contractor. Installation: By an authorized Elevator Contractor only. Permits required. Restrictions: The DriverLift™ is not a public elevator and is subject to code restrictions.